When in clinicals, I can picture my nursing mentors from many years ago walking me through procedures and asking questions. It was this learning environment which teaches so much more broadly than we expect, and I hope to convey a similar learning experience to these Hesston students. Our choice of profession should allow us to do work that we are passionate about and bring a sense of purpose. Nursing for me also allows for nurturing and caring in a professional capacity. I enjoy learning, and this profession brings new insights and challenges every day. I also may have inherited my love of nursing, since my mother was a nurse! Having students understand how concepts in the classroom relate to patients in the hospital setting. 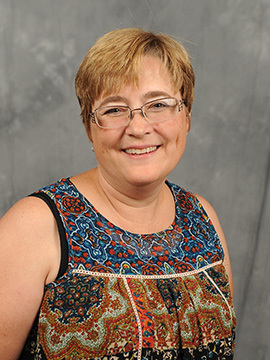 I have been employed in Hesston as a nurse practitioner for the past 10 years, and am excited to work with students connecting pathophysiology to nursing care. I have been blessed to work for the past decade in Hesston and have had many medical professionals whom I emulate in living out my faith in this profession. Dr. Hall, the staff at Mid Kansas Family Practice and others, including patients, have been strong Christian role models, leading by example. Gregg Schroeder was actually one of my favorite instructors in my undergraduate degree, asking tough questions and giving comprehensive answers with respect and dignity. I have also had the opportunity to connect with several other of our Hesston College nursing instructors through the past decade, and I’m excited to work with such a talented, capable and conscientious group of educators.